When Sake Dean Mahomed opened the first Indian restaurant in the UK way back in 1810, it’s unlikely he had any idea just how important a part the cuisine of his home country would play in British culture. Indeed, it wasn’t until the 1960s and ‘70s, when a wave of Indian restaurants (which actually tended to be owned by Bangladeshis) opened across the nation, that it hit the mainstream. Fast-forward to today, and chicken tikka masala is often cited as Britain’s national dish; we have entire TV series dedicated to Indian food and there’s a multitude of Indian restaurants on every city, town and village high street. However, ever since the first Indian ingredients hit our shores, our relationship with and appreciation of Indian cuisine has gone through several significant changes. Back in the nineteenth century, ‘Indian’ food was often quite bland; a mix of traditional British cooking with some mild spices thrown in (think kedgeree). In the ‘60s and ‘70s, a new form of Anglo-Indian cooking emerged, which is when we fell in love with tikka masala, madras, baltis and all manner of other ‘curries’ (which never actually existed in India). 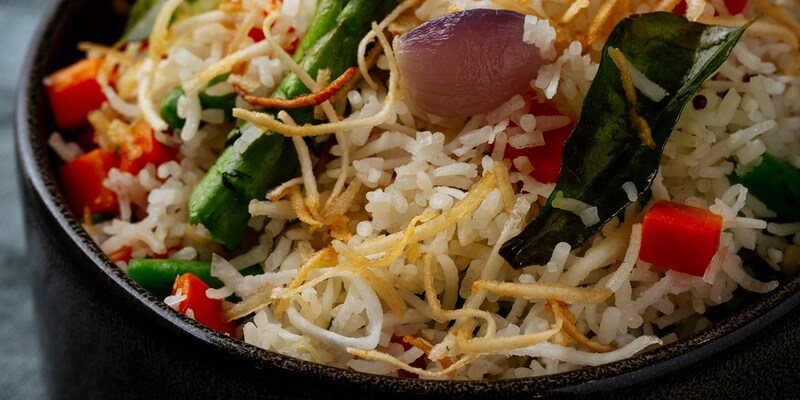 Meanwhile, cooking these dishes in the home became more prevalent, as businesses began importing the required ingredients – Tilda introduced authentic basmati rice into British shops for the first time, while Indian entrepreneurs began expanding the variety of spices shipped over to our shores. We’re now in the midst of the next ‘phase’ of Indian food in Britain. The (now obvious) realisation that, in a huge country like India, not everyone eats the same dishes, is thanks to restaurants and home cooks looking beyond the Anglo-Indian recipe canon for a more authentic experience. Restaurants which specialise in food from the south, serving dosas and lentil sambars, instead of focusing solely on the rich sauces and naans of the north, are now commonplace, and when we search for recipes at home we’re keen to find out exactly where they’re from. One perfect example of how our knowledge of regional Indian cooking has evolved is to look at one of the simplest – yet most integral – dishes of India. Basmati rice is something we perhaps used to regard as a side dish, purely there to soak up excess sauce or to bulk out the rest of the meal. Today, we know that these grains can be cooked in all sorts of different ways, and each region of India has its own methods of preparing rice dishes. In the southern state of Goa, for example, they might combine the grains with fresh shellfish such as clams or mussels. Kerala is famous for its coconuts, so it makes perfect sense that coconut oil, milk and cream is used to flavour the already aromatic basmati. Further north, in Kashmir, the rice is used to create one of the state’s legendary desserts – zarda pulao sees grains simmered in sweetened milk, with plenty of dried fruits, nuts, saffron and spices to create something renowned during festivals and special occasions. This new appetite for authentic rice dishes, regional curries and Indian street food means a higher demand for more specialist ingredients from cooks looking to recreate them at home. In the supermarkets, jars of generic curry sauces are being gradually replaced by spice kits which champion the flavours of a certain region, and we no longer have to go to specialist stores for lesser-known spices (black cardamom pods, curry leaves, tamarind and asafoetida are stocked as standard). Even rice – traditionally seen as a commodity – has become much more significant, with the quality of the grains of paramount importance. There’s no denying that this is a very exciting time in the UK for fans of Indian food. While the run-of-the-mill Indian takeaways and restaurants on the high street will always hold a fond place in our hearts, they are on the decline – but authentic regional establishments specialising in the food of certain states or areas are quickly taking their place. We’ve come a long way since the mild kedgerees of the nineteenth century and the neon red tikka masalas of the ‘70s – who knows where the future will take Indian food next.